the open view company BIOCLIMATIC PERGOLA Seesky-BIO is a pergola system which allows to increase living areas without any additional construction work, and it is a perfect solution for terraces, gardens, hotels and restaurants. Thanks to the pergola's motor and numerous sensors, pergola closes protecting the inside as harsh weather conditions are detected, so it can be used all year around. Sees-ky-Bio also offers different options for extra comfort (LED lights, music, heaters, ...) that can be controlled by control remote, Smartphone or Tablet. Bioclimatic pergola seesky-BIO is a waterproof structure with motorized oriented aluminum slats that freely move, and thanks to incorporated detectors inside temperature, sun rays and wind protection can be controlled as well as protection against other harsh weather conditions. With an elegant and modern design, seesky-BIO is an intelligent and perfect solution for sun and weather protection. Technical details SLAT SECTION Seesky-BIO is composed of 4 different profiles depending on the location of the installation. Lateral beam COMPATIBILITY WITH MAX -ONE -ECO* Not suitable for hanging systems Systems with 8 and 10 mm glass Systems with 8, 10 and 12 mm glass Systems with 10 mm glass Systems with 10 and 12 mm glass Systems with 8 mm glass * Measurements calculated on the installation made on the heavy beam (high density). * No restrictions on non-suspended systems. Seesky-BIO can be combined with adjustable windscreen habitat Air to protect from windy weather. 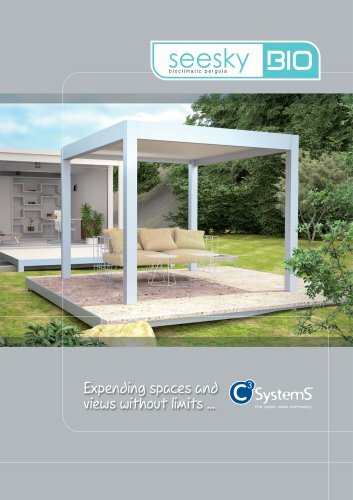 With sliding system SG Run you will protect the inside of the pergola without invading interior space. With sliding and folding system SG One you will protect the inside pergola without giving up the view and to open everything completely. Technical details Sun protecting system Habitat Win will allow you to create a sense of comfort and privacy without need of installing ant structure that invades the inside space. Aluminum lattices habitat Out allows you to control the entrance of sun rays inside and at the same time as it adds elegant and exclusive design to your pergola. Combine mosquito screen habitat Net with your pergola and you are going to be able to yourself from different kinds of insects. With a minimalistic design and simple functioning, it will be a perfect complement for your pergola.